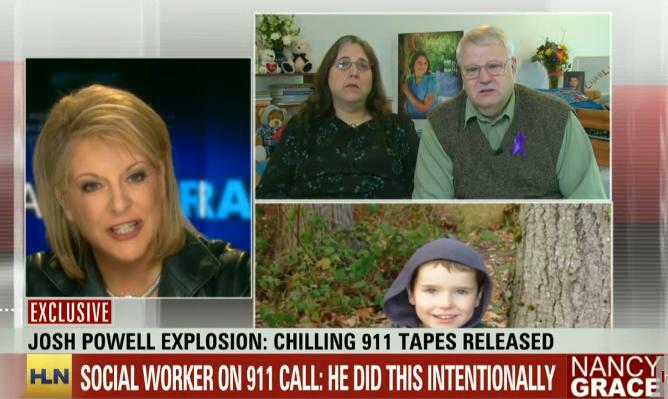 CNN's Nancy Grace talks to Chuck and Judy Cox, grandparents of two boys allegedly slaim by their father on Sunday. Screenshot courtesy of CNN. CNN’s Nancy Powell talked to the grandparents of Charlie, 7, and Braden Powell, 5, who were allegedly killed by their father Josh Powell in a fiery explosion on Sunday. Powell was a suspect in the 2009 disappearance of the boys’ mother, Susan Cox-Powell. A woman identified in most news reports as a social worker took the boys on a judge-ordered visitation to their father’s home in Puyallup, Wash. According to news reports, Josh Powell rushed the boys into the home and locked out social worker Elizabeth Griffin-Hall. Griffin-Hall banged on the door and made frantic calls to her supervisor and 9-11. However, Josh Powell allegedly set the home on fire before police and emergency responders arrived. Most news reports identify Griffin-Hall as a social worker although others say she is a case manager or visitation coordinator. According to news reports, she works for a company that oversees visitation cases for the state and local government on a contract basis. Officials at NASW’s Washington State chapter said they do not know if Griffin-Hall has a social work degree and they do not know if she is licensed. In a segment posted online on Feb. 8 Nancy Grace asked the grandparents, Chuck and Judy Cox, whether they blamed the social worker for the death of their grandchildren. They said they do not. In fact, Cox said he was glad the social worker was not also killed in the incident. Grace agreed the social worker was not at fault but questioned why an unarmed female was sent to the home of a suspected murderer. To watch the full Nancy Grace clip click here. Griffin-Hall’s husband also says she is traumatized by the incident. To watch a clip of his television interview, click here. Q: Social workers, what do you think of the issues of social worker safety and visitations in light of the murder of Braden and Charlie Powell? Many social service and mental health agencies have the wrong-headed expectation that workers make home visits unaccompanied by a co-worker…this should be corrected…it would require the powers-that-be recognize the inherent lack of safety of the lone worker on such an assignment. It is especially astonishing that this ignorance exits as the agency site is often equipped with locked doors limiting access, plexi glass barriers, “hot buttons” and other devices to protect on site employees. It takes extraordinary stupidity to ignore the vulnerability to the employee that is sent out to a home visit…ALONE! As a social worker/casemanager I have been in many homes alone where all my consumers are psychiatric and have a long history of criminality. I’ve been doing this kind of work for 10 years. I feel people who do this kind of work should be allowed to carry mace, maybe I’m wrong but the clientele are getting worse and it’s not safe. Drug use alone is a big problem and mental illness (co-occuring disorders) is a double whammy! Not safe to see consumers alone. I don’t know of an MSW program that teaches social workers to deal with this level of danger. I’m a little put off that you would use this tragedy to push your agenda. Social workers sometimes work in dangerous situations, but they should not be armed — they are not law enforcement personnel. Sometimes social workers can do everything right and there can still be a tragic outcome. In context of this entire case there should have been no home visit…it should have been in a place where Mr. Powell could be observed by the worker at all times. It is a sad that one hand does not know what the other is doing in some of these cases…and this is hard to believe in a case as notorious as this one. The judge and whoever established the parameters for these visits did not have the welfare of the children in his or her full view. The caseworker or social worker was just doing what the court established as visitation. Hopefully, we can learn from a case like this that more protection of innocent children is necessary when someone is suspected of child abuse or spousal abuse. The children should have had supervised visits in a neutral place, if at all. The system not only did not protect the boys, it failed the boys and the Cox family miserably. As if that wasn’t bad enough, It is outrageous that the 911 operator did not immediately dispatch someone to the house. This is heartbreaking. Social workers should not be subjected to these dangerous and unstable people without protection. I am not a SW but admire their dedication in work that is not very well paid and so important to society. A plainclothes police officer should have been assigned to accompany her. It seems that in the last couple decades, courts protect the parent before the child. A court that was thinking of being the child protector would have erred on the side of safety and would never have had a supervised visit in an uncontrolled setting with this parent. The courts need to look at their priorities and should face the consequences of not erring on the side of safety for the child. In the end, the judge in this matter had the chikdren’s safety in his/her hands, and he/she is ultimately responsible. People turn to the court, the judge, to help them when they fear for a child. The buck stops with the judge. Don’t expect that we will learn anything from this case unless there is a public outcry to err on the side of safety for children. I hope Ms. Grace or some other public figure will lead this charge. I am sure there are many who can profess to the current problem. why was an unarmed woman sent to the home of a suspected murderer????? how about..how were two small children sent to the home for an unsupervised visit with the suspected murderer of their mother??? REALLY??? Should’ve. Could’ve. Would’ve. Hindsight is fantastic.